Our master bathroom has a separate tiny room for the toilet. I’m sure there’s a technical name for that but I don’t know what it is. 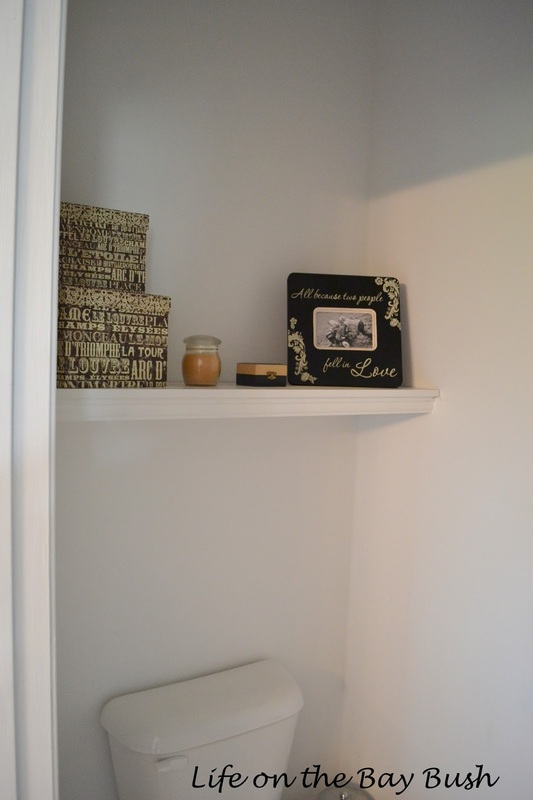 The room is too small for a storage cabinet but I really needed somewhere to store personal items for easy access. I didn’t really want to buy one of those bulky over-the-toilet cabinets since the space is already small and it wouldn’t fit the width of the room perfectly like a built-in. 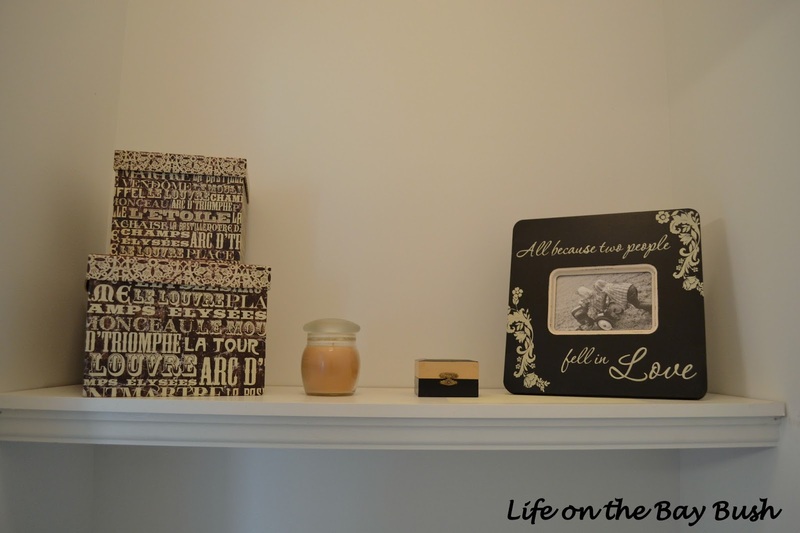 I wasn’t sure what I wanted until I saw the shelves that Jenna built at Rain on a Tin Roof. I decided to give it a try since I had all the materials leftover from my mudroom and pantry projects. Now, I KNOW that I took some pictures while I was building this but the blog forces are against me and I cannot find a single picture of the process. But the picture below pretty much spells it out. I cut a 1×2 to fit the width of the wall. Then I cut two more pieces to support the sides about 2 inches shorter than the width of the shelving board (I used 11.5″ wide shelving board). Finally, I cut a piece of molding (like I used on the front of my mudroom bench) to go across the front. I nailed each end of the molding to the end of the 1×2 on each side. I also attached a small L bracket to the bottom of the shelving board and the backside of the molding for additional support and to hold the shelf in place. When the shelf was done it was time to start decorating! I dug through my extra picture frames and found a frame that I’d been wanting to put somewhere forever. Then I wandered through my house looking for other decorative items in the same color family. I picked up the gift boxes at Big Lots for around $5 and they solved my “product” storage issue! Now, I’m trying to decide if I want to paint a fun stencil pattern on one wall or hang my Mother Teresa canvas in there… What do you think? Vote in the comments below! I think I have the pictures fixed now. I'm not sure what went wrong on the first go-round! I think you are right! I hadn't thought about wallpaper! Thanks for voting! I will check out the link! I love how the molding really finishes off the shelf. Great job, Amanda!